Back in 2003/04 the British music press hyperbole machine was in full throttle mode. Most likely buoyed by flagging magazine sales, weekly articles wrote lovingly of a Britpop renaissance. The leaders of this new school were undoubtedly a four piece from Glasgow named after the Archduke of Austria, Franz Ferdinand. Their 2004 Wire indebted debut featured the breakout hit “Take Me Out” that formed a formidable one-two punch for rock along with The White Stripes “Seven Nation Army”. 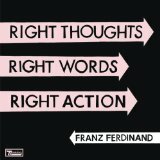 Two more good but uneven albums followed and now four years on since their last release; Right Words, Right Thoughts, Right Actions see the once mighty foursome reappear. Lead off track “Right Action” gets things started with toe tapping brilliance. Surely one of the ridiculously catchy songs of the year leads into “Evil Eye” which would have fit in nicely on their self-titled debut – all spiky guitars and shouty slogans. Things don’t slow down until towards the end with the semi-electronic pulses of “The Universe Expanded”. Back in 2004 Franz perfectly nailed angular indie rock and they have been trying to catch up ever since. On past releases the band had expanded their sound to include bedsit ballads (“The Sound of You Walking Away”) and electronic freak-outs (“Lucid Dreams”), Right Words contains none of those. What you get is back to basics Franz Ferdinand on an album that is unlikely to win new fans and will give doubters plenty of ammunition, but it is one that long term admirers will rejoice in.